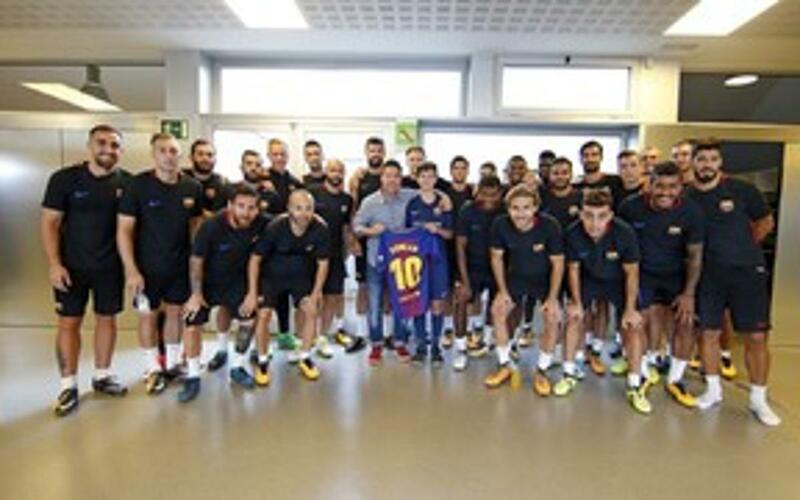 The FC Barcelona first team squad were visited by Duncan Bates, a young footballer from Vancouver (Canada) who last August 17 was in La Rambla at the time of the horrific terror attack in the city centre. The youngster was in Barcelona to attend an FCBClínic, and was enjoying the sights when his family suffered the agony of seeing how the van ended the life of his grandfather Ian Moore Wilson and his grandmother was hospitalised with injuries. 14-year-old Duncan had previously found out about the FCBCamps in Vancouver, and it was his grandfather’s idea for the whole family to travel to Barcelona so that he could take part in the FCBClínic that started last Monday 21 on the fields next to the Miniestadi. These specific training schemes involve 90-minute sessions overseen by coaches from the club’s FCBEscola soccer school. Despite the tragedy that hit his family, Duncan’s grandmother convinced the rest of the family that he should continue with the plan to attend the Clinic, knowing that nothing could have pleased her husband more than to see her grandson playing on the famous FC Barcelona facilities. The young Canadian was invited to come and see the FCB first team working out at the Ciutat Esportiva Joan Gamper, where he was able to converse for a few minutes with members of the first team squad, pose for photos and receive a shirt from his personal hero, Iván Rakitic.